Life Extension Astaxanthin with Phospholipids provides 4 mg of natural Astaxanthin derived from Haematococcus pluvialis algae. 30 soft gels per container. It is a naturally occurring carotenoid pigment that's found in certain algae and seafood like salmon, shrimp, lobster, and trout. 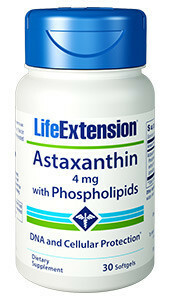 The highest concentration of Astaxanthin is found in Haematococcus pluvialis algae. 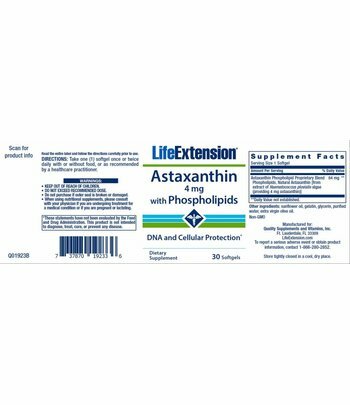 Life Extension Astaxanthin with Phospholipids provides 4 mg of natural Astaxanthin derived from Haematococcus pluvialis algae per soft gel. 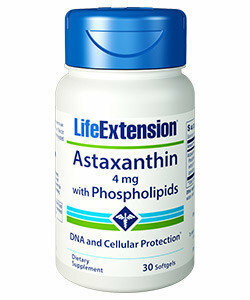 Life Extension with Phospholipids Astaxanthin is a dietary supplement in the category of food concentrates. Serving Size: 1 soft gel. Suggested daily intake: one (1) soft gel once or twice, with or without food, or as directed by a medical practitioner. Other ingredients: sunflower oil, gelatin, glycerin, purified water, extra virgin olive oil. Non-GMO.